Five months of multi-sided clashes in Syria's crowded northern battlefield have displaced some 66,000 people. BEIRUT: Five months of multi-sided clashes in Syria's crowded northern battlefield have displaced some 66,000 people, a U.N. humanitarian agency said Sunday, a day after the U.S. bolstered Kurdish-led forces with a deployment of armored vehicles amid preparations for a push toward the Islamic State group's de facto capital. Besides the autonomous Kurdish-led forces, Turkish, Syrian government and Syrian opposition fighters have all been jostling for territory formerly held by the Islamic State group near the Turkish-Syrian frontier. The U.S.-backed Syrian Democratic Forces, led by the Syrian Kurdish PKK party, are the current front runners in the race to Raqqa, the IS capital. They are now stationed eight kilometers (five miles) north of the Euphrates River city and supported by U.S.-led coalition airstrikes and a deployment of some 500 U.S. special forces operators. The Pentagon has said they are working in an advisory capacity. But Turkey, a U.S. ally through NATO, says the PKK is an extension of the Kurdish insurgency inside its own borders and has classified the party as a terror organization. It has objected strongly over the SDF offensive and vowed, too, to throw the Kurdish-led forces in Manbij — the SDF's westernmost flank — back over the banks of the Euphrates. This would disrupt the Raqqa campaign. There are Turkish forces stationed in al-Bab, 40 kilometers (25 miles) southwest of Manbij. The threats prompted the SDF to ask Russia and the Syrian army to establish a buffer between Manbij and al-Bab. With uncertainty building, the U.S. deployed a number of armored vehicles to its allies in Manbij, the Syrian Kurdish Rudaw news agency reported Saturday. Operation Inherent Resolve spokesman Col. John Dorrian confirmed the deployment on Twitter. He said it was mean to "deter aggression and keep focus on defeating ISIS," another acronym for the Islamic State group. Dorrian added the deployment was there to guarantee that the Kurdish elements of the SDF have left Manbij. Turkey says they have not. The Syrian military, meanwhile, has driven east of Aleppo to draw a front with the Turkish-backed Syrian opposition forces south of al-Bab, blocking their route to Raqqa. Government forces, backed by Lebanese Hezbollah militants and Russian airpower, have moved quickly in the direction of IS-held al-Khafseh, on the banks of the Euphrates. Al-Khafseh is home to the main water station for Aleppo, Syria's largest city. Government forces are 13 kilometers (8 miles) away, according to the Britain-based Syrian Observatory for Human Rights monitoring group. The U.N.'s OCHA agency said that the Turkish and Syrian opposition campaign to capture al-Bab from IS militants displaced 40,000 residents. They captured the town on Feb. 23, after starting operations in November. 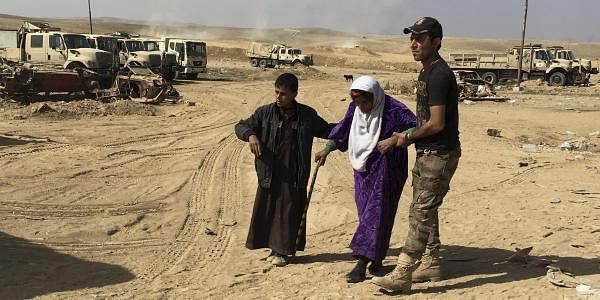 The office said another 26,000 residents have been displaced in fighting around Manbij, held by Kurdish-led forces, and al-Khafseh, held by IS militants. Al-Khafseh is home to the main water station for Aleppo, Syria's largest city. In other news, a Syrian search-and-rescue group reported a bomb blast in the opposition-held town of Azaz, north of Aleppo, killing at least eight people. Azaz is 50 kilometers (31 miles) from al-Bab. The Observatory said an IS sleeper cell was responsible for the blast. The militants carried out a suicide car bomb attack in the nearby town of Sousian on Feb 24, killing at least 60 people. Most of the victims were civilians who had gathered seeking permits to return to al-Bab, a day after it was liberated from the extremist group.